The Cornea is the front part of your eyes helping to focus your eyesight. It can be very difficult to enjoy life if this part is distorting vision. There are many Corneal problems affecting vision (see pictures above). Perhaps Lasik or RK did not give the desired results. 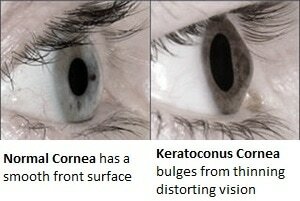 Keratoconus is another when the cornea thins and bulges distorting vision. This practice has an array of options to best correct vision. Unlike traditional 'gas permeable' lenses, Scleral contact lenses are designed by the doctor for giving excellent comfort - even for extremely dry eyes. Kurtin Vision Specialists use the latest ScanFit OCT Technology to maximize vision too. A complete selection of Scleral contact lens designs are fitted right here off the Dallas Tollway. Buy Scleral replacement lenses like Boston XO2, ZenLens, Atlantis, Genesis, Europa, Jupiter, OneFit, Metro and Rose K among others. Just give us a call, or fax your Rx to 972-908-9999 . Corneal cross linking is mainly for Keratoconus. This procedure involves placing riboflavin (vitamin B2) drops on the cornea, which are then activated by ultraviolet (UV) light to strengthen the cornea. 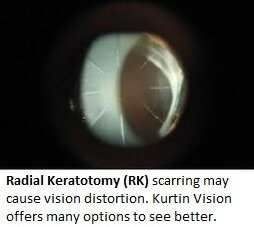 In many keratoconus patients it may stabilize vision. This place offers consultation on these tiny plastic corneal inserts. 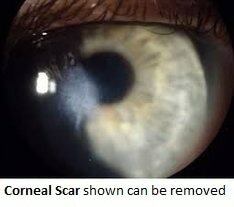 They are surgically implanted to re-shape the cornea for clearer vision. Intacs can make it easier to wear contact lenses or eyeglasses. Some people reach the point where surgery can provide acceptable vision. This is when a cornea graft, dmek, dsek or keratoplasty is considered depending on which of the 5 corneal layers need repaired. Dmek and dsek restores cornea clarity from a cloudy cornea like Fuch's Dystrophy. This North Dallas eye center will examine your eyes and give expert advice on your eyesight. Some people have disfigured eyes from injury or white scarring. No need to be self conscious. Come here for a custom soft or rigid contact to match your eye color. Guaranteed Satisfied.